First, I have a confession: I'm a huge NFL fan and finally, the waiting's nearly over for those of us who, since February, have been impatient to see some real American football. As the teams prepare for the new season, I was struck by an 'All you need to know from A-Z' article about my beloved Atlanta Falcons. And that's the inspiration for this focus on my equally beloved Hungary. Always a challenge to find an economic indicator beginning with 'x', and you'll see if I succeeded in part two but let's kick off part one where you'd expect. Hungary is facing a significant labour shortage with double-digit wage growth. Despite that, wage-push inflation is still a no-show on the national level. But what if the National Bank of Hungary (NBH) has asymmetric information and the reality is that companies are preparing a significant price hike in 2019 due to the jump in labour cost combined with elevated energy prices and weaker HUF affecting import-needy companies? If that is the case, we might see a surprise strengthening of core inflation in 2019. The pre-financed EU projects ate up HUF 956bn or two-thirds of the cashflow-based general government deficit in 1H18. Without this effect, the underlying budgetary situation would be better than the almost record-setting 2016, when the government ran a balanced budget until November, but then decided to spend HUF 921bn to reach the original deficit goal. Bottom line is, you don’t need to worry about the budget. The industry sector added 0.9ppt to the 4.0% YoY growth in GDP in 2017. However, the momentum was broken this year mainly because of capacity constraints, which are visible when you look at the difference between raw and working-day adjusted data. In the upcoming months, we expect industry to overcome those capacity constraints on the capital side, but labour shortages will remain a challenge. The Hungarian forint (HUF) depreciated 6% against the euro in the first six months of 2018, reaching a record high level of 330. Both external and internal factors contributed to the freefall. The general risk environment was negative for EM FX, while the ultra-loose NBH stance and rising credibility considerations made HUF vulnerable. The tentative improvement in risk sentiment and declining imminent trade war concerns helped stabilise the heavily oversold HUF, but that stability could just be an illusion. Hungary’s Eurozone accession has been a hot topic for years, although real movement here is notably absent as the current government seems satisfied with having its own sovereignty as far as monetary policy is concerned. The latest NBH publication on this highlighted new domestic criteria which would be needed if the country were to adopt the euro. Decision makers want to see Hungarian GDP per capita in PPP terms (Purchasing Power Parity) at 90% of the EU average. It's currently at 67% so there's still a lot to do before Hungary will be able to join the others in the Eurozone. The parliament recently accepted the 2019 budget. It does not contain major tax reforms except for the 2 percentage point social contribution tax cut. When you take into consideration that reserves increased by 50% (0.8% of GDP), the 2019 budget was always planned to be a safe one. Moreover, next year’s budget is restrictive, as the positive output gap widens and the government’s primary balance improves. Recent trade war stories endanger the growth of several open economies, such as Hungary's. Fortunately, Donald Trump and the EU's Jean-Claude Juncker made a pact which included working to abolish almost all trade tariffs and barriers between the US and EU. It is far from a done deal, but at least there's a silver lining. Hungary is pleased with that not least because the export volume of automobiles in proportion to total exports was 17% in 2017. According to the NBH, residential property prices rose by 14.8% YoY in 2017 and 1Q18 raised the stakes with a 15.4% YoY increase. Demand is very much exceeding the supply side thanks to the government’s housing programmes while the supply side is facing constraints due to labour and asset shortages. We don’t expect any easing until end-2019 when VAT on new houses will jump back from 5% to 27%. The NBH has left the base rate at 0.90% since May 2016 and it doesn't seem it will change in the near future. Since inflation could more permanently reach the NBH’s target by mid-2019, the first rate hike could come in early 2020. Until then, policy normalisation will start with Bubor pushed back to 0.90% by the end of 2019. Large companies are the juggernaut of this economy, having much better productivity due to economies of scale. As the country’s overall competitiveness needs to be addressed, this could be a focal point. 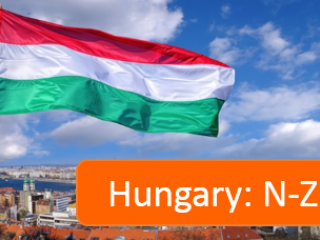 Hungarian small and medium enterprises generally aren't big enough to benefit from these economies of scale and we expect to see more mergers and acquisitions in this the SME sector. When it comes to the knowledge-intensive sub-sections of an economy, Hungary is lagging not just the Eurozone average but also its regional peers. The main issue is the lack of willingness to invest in research and development which is partially responsible for relatively low productivity. If we are serious about improving Hungary’s competitiveness, we need to put knowledge-intensive sectors in the limelight. According to our latest Leading HUBE (LeadING Index for the Hungarian Business Economy) indicators, we expect a mild deceleration in 2Q18. Looking further forward, as the MoM index suggests, we can expect strong economic activity in 2H18, but because the indicator has just dropped into negative territory for the first time in 33 months, we can expect a significant deceleration in 2019. Hungary needs to avoid the middle-income trap if it wants to catch up with developed economies. Based on the NBH’s calculations, relative development compared to Austria with and without reforms could reach 86% and 59% in 2030, respectively. If Hungary carries out the 180 measures suggested by the NBH, our long-term potential growth could be as high as 4.4% instead of the 1.4% rate without reforms.